Hello everyone! Welcome to Sparkle Creations Rubber Stamps Challenge #12! We hope you will join us for a fun sketch challenge this week (sketch designed by Mary Giles). In Mary's honor, the team is doing a special farewell blog hop as this is Mary's final month as a SCRS design team member. Mary, we are sorry to see you go and will miss your wonderful creations.. I hope that our paths will cross again in our papercrafting journeys! This is also Risa West's last day with us. Thank you, Risa, for being our fabulous September Guest Designer! In other Sparkle Creations news, Kim Yu will be joining our Design Team! We will begin peeks for our October release next Monday and Piali Biswas will be our October Guest Designer! Welcome, ladies! If you happened here by chance and would like to do the full hop, please start at the Sparkle Creations Rubber Stamps blog. If you came from Laurel's blog, then you are right on track. Your next stop is Sparkle's blog. I turned the sketch 90 degrees and used Scooter Chloe for my card today. I colored her with Copic markers and added some strips of patterned paper from the Prima Fairy Flora collection. One last note... Sparkle Creations is sponsoring 365 Cards all this week. A different challenge will be posted each day - the first one is teal, travel, and torn (paper, that is). Please head on over to the blog to see all the details. Accessories: Petite Oval and Scalloped Petite Oval Nestabilities (Spellbinders), Markers (Copic), Flowers (CTMH), Pearls (Prima), Foam tape, Thread, Sewing machine. Beautifully done Steph! I love the soft colors and all the stitching. Fabulous! This is so cute! I love the pink! What a beautiful card Stephanie! Your image is adorable and I love your design papers, very pretty! I love the background Stephanie! Just a darling card! Super cute card Stephanie! Great job coloring that darling image & love the lil' flower embellishments! oh, this is pretty Stephanie, love the image...your stitching is fabulous! I so excited to be the October GDT!! looking forward to creating with the fabulous DT. I love the colors and stitching! 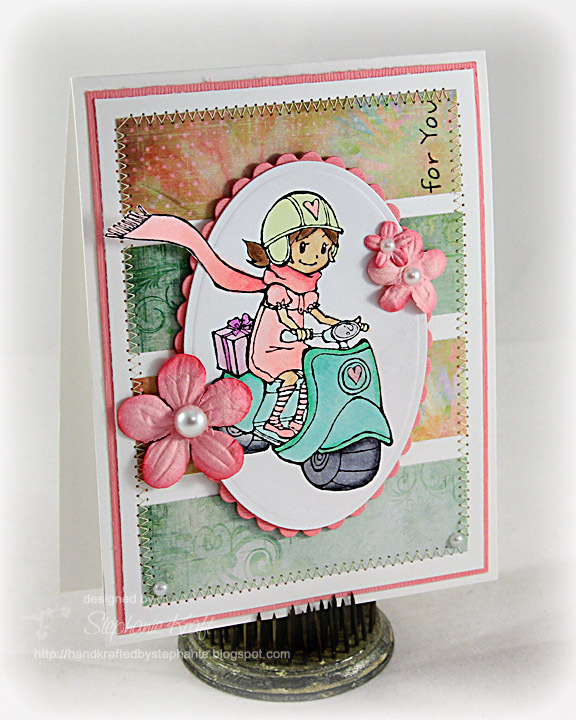 Such a sweet image and love the paper you used as her background to coordinate with the pretty colors!